My husband and I visited my mother on Long Island last week. Going back to the town where I grew up is never easy. In many ways it feels like a foreign country to me now, one where everything looks familiar but where the language and the currency are not recognizable. Due in part to how I have changed since my youth, it is hard for me to stay in the here and now when I visit. My childhood memories are not the best, and there is a great deal of loss to relive when I am there. I’m grateful it takes about 5 hours to get from my front door in New Hampshire to the town line of where I grew up. I like that the travel time gives me space to mentally prepare myself. Connecticut, with its wide highways filled with huge trucks and hurried commuters, is the place where I begin to tense up in anticipation of nearing the island and all its associated memories. Don’t get me wrong, the good memories are there, as well—fun times with my cousins, sleep-overs at my best friend Renée’s house, Carvel ice cream cones and Archie comic book on Saturday nights with my father—to name a few. But that I extricated myself from that place, from my youth, is a testament to human perseverance. I still harbor the fear that I will be consumed by dark memories, and never be able to come out. But that’s never happened. This is because Al and I have worked hard to build our family based on love and trust in a community of thoughtful people. I am confident someday our children will look back on their childhoods as the basis of all that is good in their lives, not something they fought against for survival. For that reason, the return trip back to New Hampshire is always full of joy. The moment we cross the Throg’s Neck Bridge and move past Long Island Sound I know that the darkness of my youth is truly in the past, the future bright. I can feel it especially now with sunlight streaming in our windows as the snow melts and buds begin to awaken in the trees. 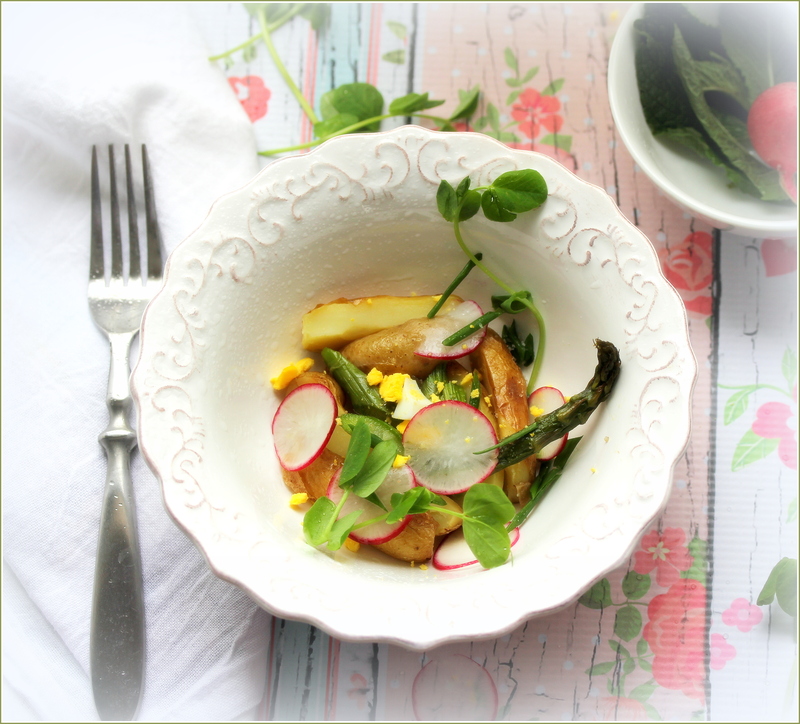 This spring salad of Roasted Fingerling Potatoes, Asparagus, Radishes and Herbs is full of the tastes of springtime. 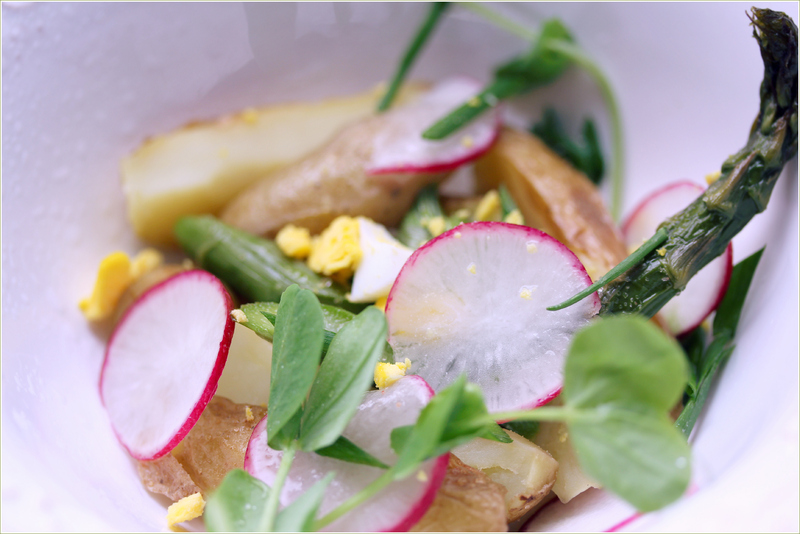 The delicate potatoes and asparagus are roasted in the oven to give bring out their flavors and textures. Roasting them creates a crunchy texture on the outside with a soft, creamy texture within. 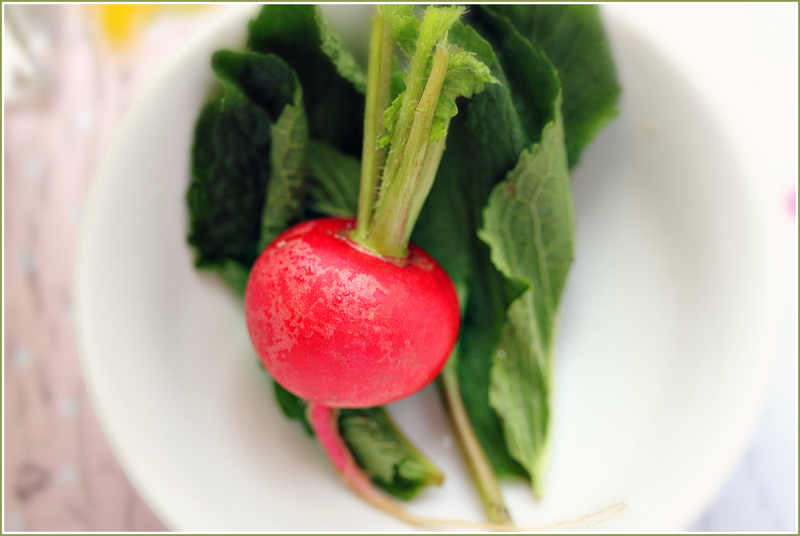 When topped with eggs, fresh radishes and herbs, the simple vegetables are elevated to a complete meal worthy of the season. Consider serving this salad with Carrot Soup and some Fragrant Onion Rolls for a full and satisfying meal. 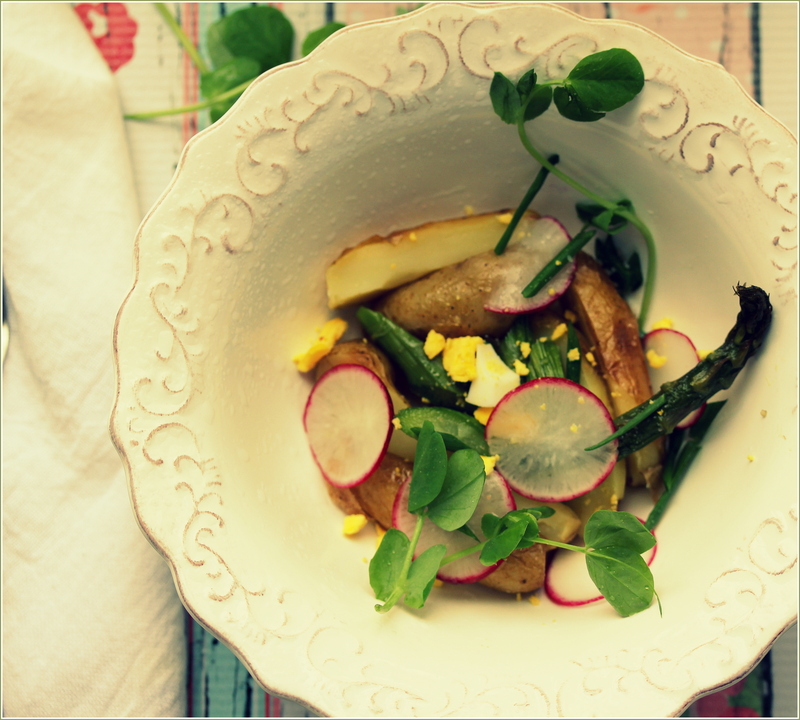 Cut the cooled potatoes and asparagus into bite-sized pieces. Divide them evenly between four small bowls or salad plates. 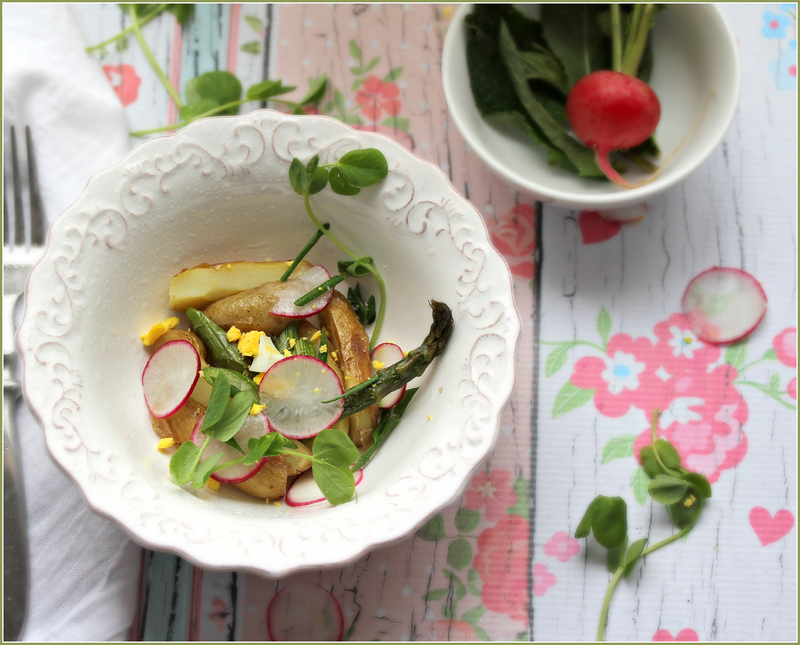 Top decoratively with the radishes, herbs, chopped eggs and pea shoots. Drizzle with lemon juice and olive oil. Add salt and freshly ground black pepper to taste. Fingerling potatoes are small, stubby potatoes and that resemble a finger. Their skin is golden and the potato, once cooked, is creamy inside. To make this a heartier dish, double the ingredients. Add cooked chicken or shrimp on top. For a full meal, serve with Fragrant Onion Rolls, Carrot Soup, a wedge of cheese and a bottle of chilled cider.